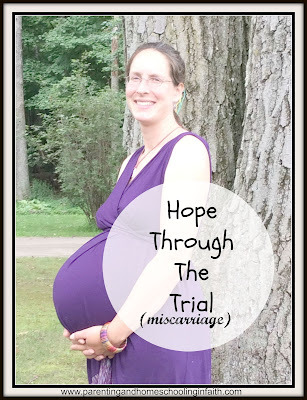 Diamonds in the Rough : Hope Through The Trial! from a guest blogger. A friend of mine. Sharing Bearing her heart & soul. Be sure to read to the end of the story. There's hope in trials. Always with Christ. Side note: she's had the baby! I think of a lot of different things. I ponder how waiting around for the baby to come is like waiting for the return of Christ. I am trying to be as prepared as I can, but I do not know exactly when he (Jesus or our baby) will arrive. I hate waiting... I am very thankful God is patient and understanding. I also think back about how blessed this pregnancy has been. No major complications and I'm so healthy, probably from keeping up with my other two. This child is a pleasant surprise. I also am thinking of a child I will never meet. You see almost two years ago I had a miscarriage. It doesn't matter how far along I was, it still hurts. There was a sense of hope, excitement and anticipation, which is then taken away. My body still needs to heal and I are reminded of what could have been. Where was God through all of this?? The answer: He was right there with me. Who am I to question the Lord? Job was a book I've read several times. I do not know the plans He has for us. But I do know that God never left my side. He brought family around to help with the boys and myself. My husband was beyond amazing. God heard my prayers, through tears and anger. And I know He comforted me though His word and songs. I also dreamed a very peaceful dream that helped me to let go and know the Lord had our little one safely beside Him. Looking back now at how life has been in the past year, I can say we have been blessed in so many ways. The boys and I have taken advantage of amazing homeschool connections and filed trips. We did lots of work on the house and grew our family business. I survived and life goes on. It still hurts some days, but letting go and trusting God’s plan was the best thing I could have done. Letting go wasn’t easy. I questioned, doubted, cried, yelled, and accepted… I had to let go of control daily until I was at peace. I then prayed every day for another child. We tried for over a year. It got rather stressful and it was all I could think of. Again I realized I needed to let go and trust that God had an ultimate plan for our family. Even with our two boys I knew God had so much for us to do. I finally let go and embraced our awesome family of four. 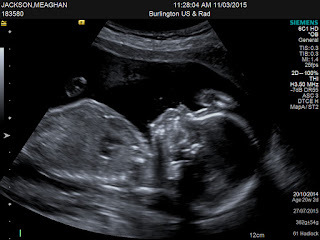 Then of course God blessed us even more than we could imagine and I was pregnant again. This time I took one day at a time. When fear or worry gripped me I prayed scripture to remind myself that God was in control. One particular night I started getting sharp pains. It was still quite early on in my pregnancy and I lay there all night praying for our little one and letting it all go to the Lord. Thankfully it was just gas pains from my Dairy Queen Blizzard craving (I'm dairy sensitive). But, from them on I knew that no matter what happened, our lives are not about our present circumstances, but about our relationship with the Lord. We are here for His glory not our own. So here I am, excitedly waiting to meet our little boy. No matter what happens (and I have a very active imagination that can worry lots) our God is in control, life will go on and our relationship will be strengthened. Are there more children in the future for our family?? Now that I am truly leaving up to God! Meaghan Jackson is a homeschooling mom with three boys. She helps her husband with their family business, and blogs over at Joyful Mud Puddles. Well done Meaghan. It's a courageous thing to put yourself out there. It is a hard thing to walk the road of welcoming a new child after loss. A test of faith. It is nine years for us now, and the best commentary on the situation I would offer is that Romans 8:28 applies here. Oh, how I understand. My baby #7 (4th bio) is 9 years younger than the next oldest biological child. Those years were filled with loss and pain... and a whole new understanding of who God is.